One of the most difficult conversations you will ever have with your child will be on the topic of “divorce or separation. 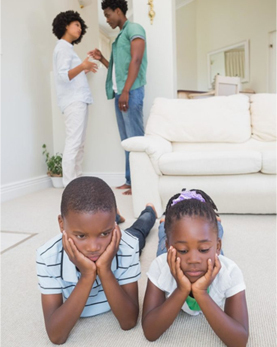 Most parents try to avoid discussing divorce and separation altogether or simply pretend that there is no elephant in the room. Even though children may not understand the circumstances or what happened, it is completely safe and necessary to have this conversation, but it must be done is with gentleness and wisdom. When possible, you and your partner should be on the same page before approaching your child. It’s critical that both of you recognize the child’s needs are “priority”. Whether the separation was a mutual decision or one-sided, recognize it has serious implications for the child psychologically and emotionally. Do you and mommy not love each other anymore? If I change, will you stay together? Does that mean, my brother/sister and I will be separated? How come my other friends don’t have to go through this? Will I still see you everyday? Will you both still come to my games? When discussing the divorce or separation, be sure to empathize with your child. Let them know what they’re feeling is normal and that both parents are available for support. Validating and normalizing your child’s feelings will give them a sense of some security rather than making them feel isolated and abandoned. Remind your child that it is not their fault and that separations are normal and that they do happen. Let them know that the conversation about the separation is an open topic and do not slander or blame the other partner in front of the child. Discuss and be open to the change, let your child know about the living situation, what to expect and that each parent will still be around. You want to build security and trust within your child during this time, as it will benefit them in the long run. Reassure your child that both parents will still be present but on different circumstances- don’t make promises that you cannot keep. Your child will remember the promise and will be more upset when promises have been broken. Stick to the same routines, do not spoil or give your child special treatment due to the divorce. It will create unhealthy coping strategies, which will later lead to unhealthy choices. Be open and be honest, take care of yourself. Seek support if necessary! It is completely normal to feel devastated or torn up about the separation. Speaking to somebody or professional can help. At Positive Kids, we offer programs and counselling to children who are having a difficult time accepting a separation/divorce or who are currently in the middle of dealing with a separation/divorce. If your child is c experiencing the emotional pitfall of a divorce or separation, give them the tools they need to navigate through their emotional struggles. Please do not hesitate to contact Positive Kids for any additional information on our services!